Short-Term Mission Team experiences can be an important step in preparing for long-term kingdom work or for life at home as a World Christian. Whether giving a weekend, a week, or longer, serving others cross-culturally will give you a bigger picture of God's kingdom, a wider perspective on His work, a greater appreciation for His workers and a deeper understanding of the world's need. You will serve others in new and meaningful ways, your faith will be challenged and you will grow in your relationship with God and your relationships with others. Be bold! Step outside of the comforts of your daily life and watch God at work. 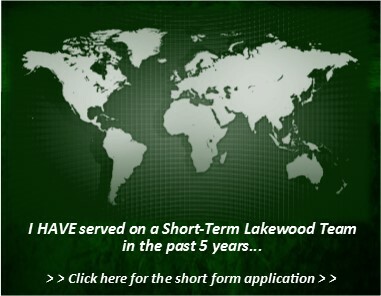 Lakewood Teams are a great way to be a part of short-term missions but they are not the only way. Sometimes individuals are called to other opportunities with organizations like Reign Ministries (Royal Servants), ReachGlobal (e.g. TREK7), Urban Impact or others. Many of these opportunities are for a summer or even longer but do not rise to the level of long-term service. Lakewood Missions encourages you to respond to the call to go. If you are planning to go with an outside organization and would like to apply to Lakewood Missions for financial support, contact the Missions Office.